With one very happy winner of a free copy of Skyward Sword and a Facebook page with 2217 fans, it’s time for us to move on to our next target. As we initially announced as a part of our Facebook Give Away, when we reach 5,000 fans we’ll be giving away a free bundle of Ocarina of Time 3D and a Nintendo 3DS, the color of your choice. So we now have our eyes set on the new target of 5000 “likes”. How fast do you think we can get there? There’s 2783 likes to go, so spread the word. Tell your friends and family, and share it around the web. Remember that anyone will be able to enter the draw once we reach 5000, no matter where you live, and we’ll ship it to you in your region’s version. 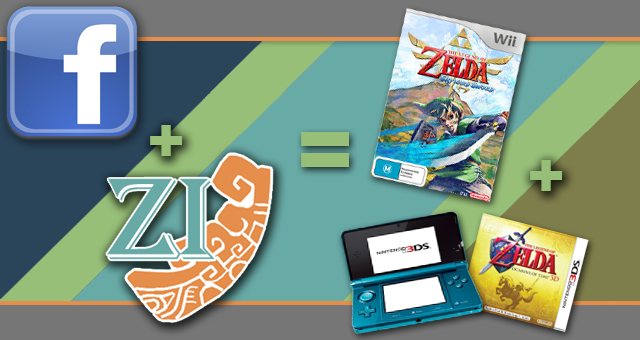 Our winner of Skyward Sword was over in England, do don’t let that keep you from entering. We’ll keep you updated on our progress. 5000 here we come!